Mazda has bolstered its award-winning BT-50 range with the addition of a six-speed automatic transmission to the 4x4 Freestyle Cab Utility XTR. Mazda Australia has strengthened its award-winning BT-50 line-up with two new models and the addition of new equipment to its range-topping BT-50 4x4 Dual Cab GT. Mazda has today confirmed pricing for its All-New BT-50 Freestyle and Dual Cabs. Value is the name of the game with each new model snaring a competitive price tag to match an extensive equipment list. The all-new Mazda BT-50 has the latest safety features seen in passenger cars. It also embodies comprehensive safety measures specific to utilities trucks. Since its introduction in 2006, the Mazda BT-50 has forged a solid reputation as a reliable and tough partner for both work and play. It has also become known as one of the best value utilities available. The body colour range for the all-new BT-50 consists of 8 mica or metallic colours. Mazda has confirmed that the Freestyle Cab version of its All-New BT-50 utility will make its global debut at the upcoming Australian International Motor Show to be held in Melbourne on 1 - 10 July. Mazda Australia continues to perform well achieving their second best October on record and maintaining pole position as Australia's leading importer and fourth in the market, according to VFACTS figures released today. The B Series commercial range has been Mazda's longtime workhorse. From December B Series makes way for the BT-50, Mazda's new truck bursting with style and strong, common-rail high torque diesel engines. 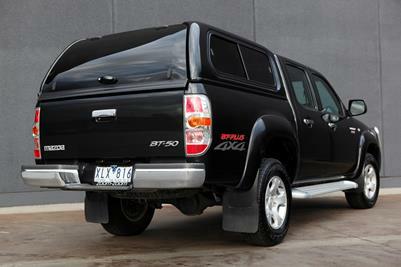 Mazda BT-50 Dual Cab SDX.